As this year comes to a close, we reflect on the past and look forward to the new. And then make us some cocktails. 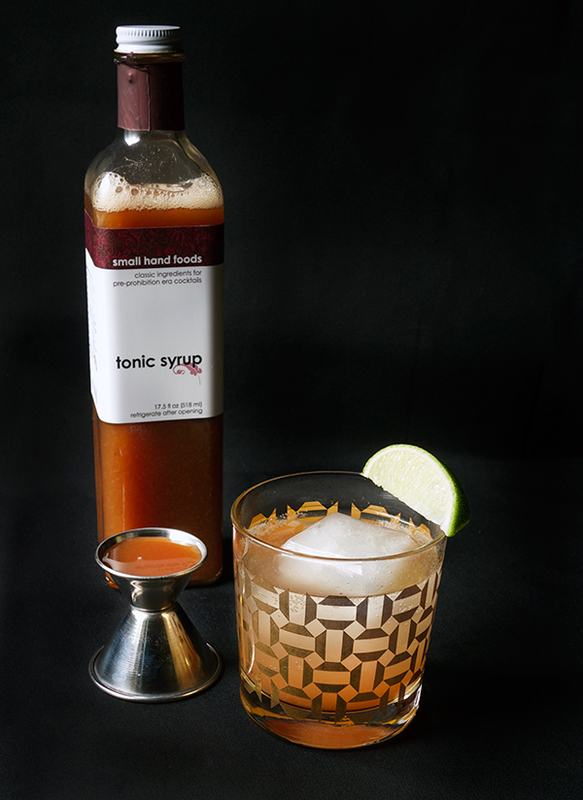 Today we’re helping holiday cocktail making just that much easier with this trio from Small Hand Foods, Host, and The Countryman Press. First, Small Hand Foods has just put out a new syrup: Passion Fruit! If you’ve been around these parts often enough, you know how much I LOVE passion fruit, but loathe trying to shop around for the fruit. This syrup is the REAL DEAL and worthy of your next Hurricane. Next, you need some extra special cocktail recipes come holiday time. 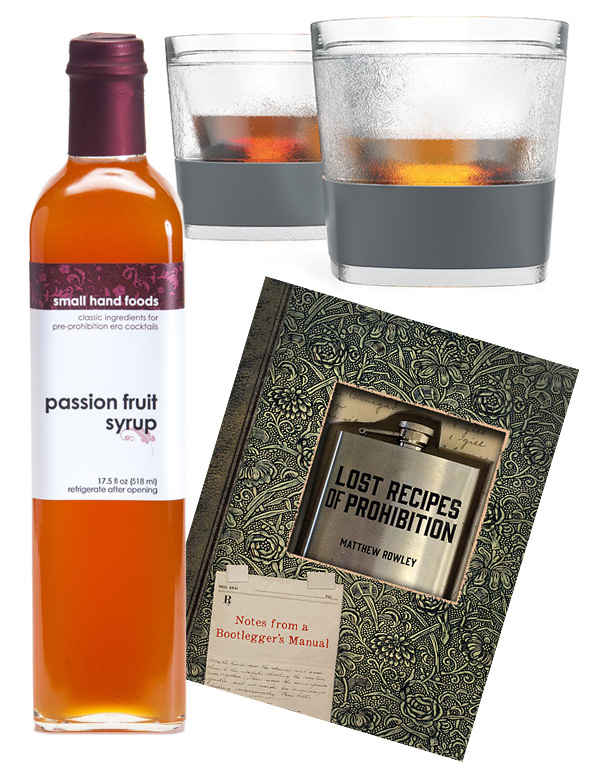 So why not check out these Lost Recipes of Prohibition by Matthew Rowley? Browsing through the book feels like you’re getting a secret glimpse of someone’s diaries… cocktail diaries. And lastly, you need something to put all those cocktails in! Keep your drinks cool while you’re by a hot fire with these WHISKEY FREEZE™ Cooling Cups. Ready to party? Check out the options below to enter and get up to 10 entries to win. Giveaway ends at 11:59pm PST Thursday December 10th, 2015. Please see terms and conditions below (sorry, only open to U.S. and Canada residents). Good Luck! 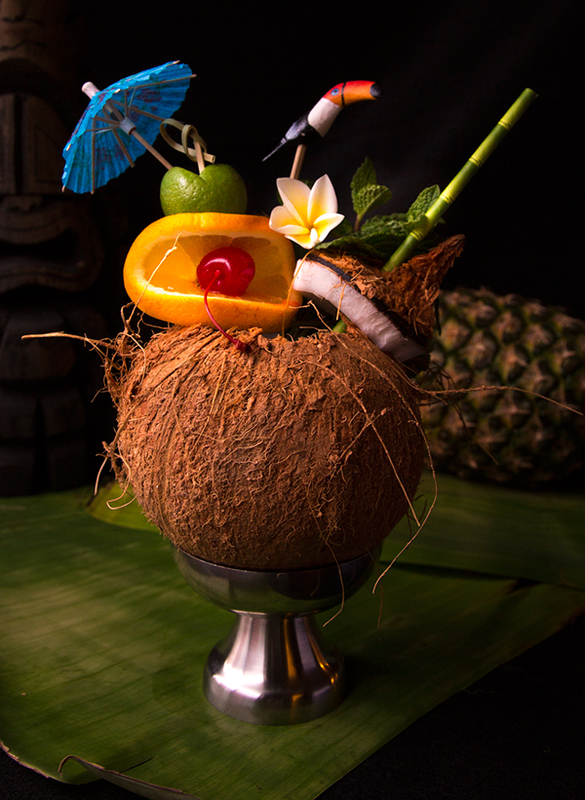 At our last Coconut Club event we switched up the signature cocktail (the one in the coconut) to include some orgeat. Nathan and I are pretty particular about the quality of the ingredients we use, and since we didn’t have time to make it ourselves, we enlisted the help of Small Hand Foods. Their orgeat is our go-to brand, especially when we are trying to wow the pants off a crowd of discriminating Tiki cocktail fans. This time around, when we got our comment cards back, people seemed to really love the new incarnation of the signature drink. And today I’m giving away a bottle for you all to try at home. That and a few more Small Hand Foods syrups to get drink making. Small Hand Foods creates “classic ingredients for pre-prohibition cocktails”. But don’t let that stop you from creating whatever the heck you want. Get futuristic and sphere-ify that drink! Ready to start mixing? Check out the options below to enter and get up to 12 entries to win. Giveaway ends at 11:59pm PST April 21st, 2015. Please see terms and conditions below (sorry, only open to U.S. residents). 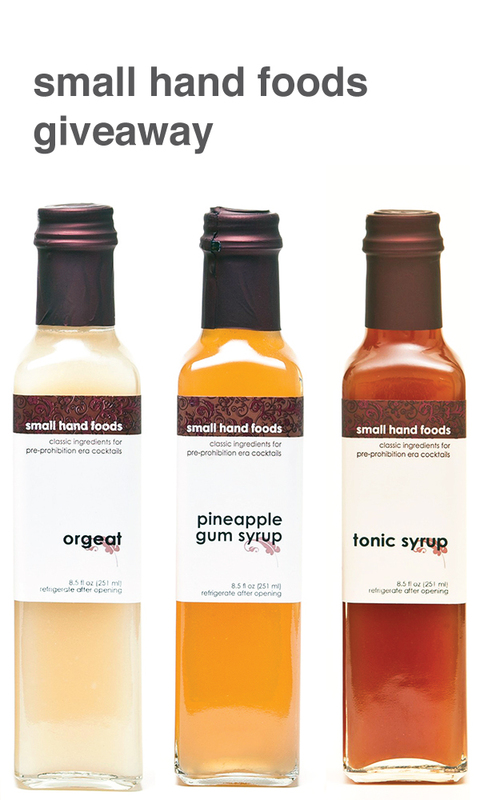 For more information on Small Hand Foods products, please visit them at smallhandfoods.com. Good Luck!